Your home should be your "allergy safe zone." Washable Air Care filters provide relief for allergy sufferers! Reduces airborne dust and allergens like pollen, dust mites, mold spores and pet dander. 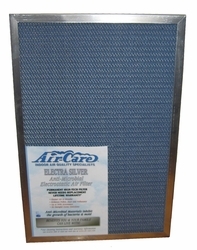 We are an authorized Air-Care Electrostatic Filter Dealer. All filters come with Lifetime Air-Care warranty. * Replaces your furnace and/or air conditioning filters. ** Filters must be 24-5/8" or less on one side. For filters larger than 24-5/8" on both sides...please order our BoAir 5-Stage filter. 2) Determine the size filter(s) you need and enter the size in the box above. 3) Use the 3rd drop-down menu above to choose how you measured your filter size. Either (A) The size you entered is printed on your current filter...or...(B) You measured the filter yourself with a tape measure. Please double-check your filter measurements as there are no refunds for errors in measurement. Feel free to email us at info@neverbuyanotherfilter.com with any questions. Stop buying disposable filters every 3 months. This filter will pay for itself in about 1 year! Hose it off or vacuum it off every 4 to 6 weeks. Frame is made from non-rusting aluminum. Come with LIFETIME WARRANTY. Mail it in or register online. Watch out!!! There is no standard for electrostatic filters. There is a delicate balance between dust arrestance (to capture the airborne dust) and air resistance (airflow through the furnace). If the filter is too dense, it can put a strain on your air handler, shortening it's life and raising your electric bill. Air-Care has been making filters for a long time and is considered the industry standard in the HVAC field. They provide a great balance between arrestance and resistance. No more remembering to buy disposable filters.